(Alternet) When Amazon announced plans to locate a $5 billion, 50,000-employee complex as its second headquarters somewhere in North America, state governments and municipalities fell over themselves offering billions of dollars in tax abatements and corporate subsidies to secure the prize. It might behoove the remaining 20 cities that have made the final cut to heed the warning from Virgil’s Aeneid: “I fear the Greeks, even when they are bearing gifts.” Especially when the gifts come in the form of a modern-day digital chain gang. Amazon likes to see itself as a cutting-edge, 21st-century growth company, always working to expedite delivery to its customers, whether by means of a drone, or eliminating queueing and bagging at its newly acquired Whole Foods stores with a new smartphone app. Beneath this high-tech sheen, however, the online retailer and tech giant engages in labor practices that provoke comparisons to a 19th-century sweatshop. The company routinely pays wages barely above the poverty line, while using intrusive surveillance systems to monitor the workforce, fence them in with elaborate rules, set target times for their warehouse journeys, and then measure whether targets were met. All of this information is made available to management in real time, and if Amazon’s “employee-athletes” fall behind schedule, they receive a Big Brother-like text message pushing them to reach their targets or suffer the consequences. Failure to do so is met with a “three strikes and release” discipline system—being a euphemism for getting sacked. In essence, you’ve got a $550-billion-plus global conglomerate with virtually unchecked market power and no sign that its legally advantageous position will be challenged anytime soon via vigorous anti-trust enforcement—and certainly no encouragement of unionization to combat its abusive and intrusive work practices. There’s a lot to admire about your labor movement. With community organizing, creative street heat, and militant strikes, you’ve just scored the biggest win yet in the Fight for $15, forcing a pro-corporate Ontario government to raise wages for 1.7 million workers and grant new card-check union recognition rights, paid sick leave, scheduling rights, and equal pay for temporary and part-time workers. That’s inspiring! Last year’s organizing victory of 1,000 casino workers in Vancouver stands as another glowing example of grassroots power-building. And hardly a season goes by when we don’t hear about yet another militant strike by construction workers, daycare workers, and others in Quebec, where union density stands at 40 percent, four times the US rate. So there’s reason for us to be proud of our northern cousins, perhaps even a bit envious of you. That’s all the more reason for us to be shocked and worried to hear about the fratricidal split now unfolding within the Canadian house of labor. The leadership of Unifor, the largest private sector Canadian union, declared earlier this month that it is leaving the Canadian Labour Congress (CLC) over allegations that US-based international unions are meddling in the internal affairs of their Canadian affiliates. The internet is abuzz with talk of CLC retribution against Unifor. (Mother Jones) A new union is setting their sights on workplaces known for underpaid employees who work long hours with few benefits and uncertain career prospects while being exhorted to put teamwork before their well-being: campaign offices. In advance of the 2018 midterms, the newly formed Campaign Workers Guild is seeking to organize election staffers, particularly those who work for pro-labor Democrats. The union recently won its first victory when it reached an agreement with the campaign of Randy Bryce, the mustachioed ironworker and proud union member who is running to unseat House Speaker Paul Ryan in Wisconsin. The deal includes a $3,000 monthly minimum wage floor, paid time off, health insurance reimbursements, and improved mechanisms for reporting sexual harassment. The Campaign Workers Guild is taking its fight to the doorstep of the Democratic Party, which has long positioned itself as the champion of organized labor. “We’re calling on Democratic candidates to practice what they preach,” Ackerly says. “We’re starting with Democratic candidates because there is an explicit disconnect between the Democratic platform and how Democratic candidates treat their workers.” The goal, she says, is to change a campaign culture that tells idealistic workers “to sacrifice our health, financial security, and family time to attain the future we believe in. (Mother Jones) Next Monday, the United States Supreme Court will hear oral arguments in Janus v. AFSCME, a case that boils down to the question of whether public-sector unions have a right to collect dues from workers they bargain on behalf of, even if they are not union members. If the court’s conservative majority rules in the plaintff’s favor, it could choke off a critical source of union funding. Forced union membership is illegal, but many unions collect “fair-share” or agency fees from employees in unionized workplaces who do not join the union but enjoy the advantages of being represented by it nonetheless. The fee, so named for the idea that everyone should chip in to help cover costs the union racks up bargaining for things like better pay and safer working conditions, is an important union revenue stream, especially as the labor movement struggles to bounce back from a decades-long decline. Mark Janus, the case’s plaintiff, is a child support specialist at the Illinois Department of Healthcare and Family Services. He pays an agency fee to the American Federation of State, County and Municipal Employees (AFSCME), but he’d rather not. His legal team’s argument is straightforward: As a matter of free speech, no one should be forced to pay fees to a union they disagree with politically. Anti-union crusaders, however, have been far less restrained in explaining their motives for championing Janus. The State Policy Network, a web of 66 free-market think tanks, has described the case as a way to “defund and defang” its adversaries. The Liberty Justice Center, one of the entities representing Janus, is a partner in the SPN network. Unions argue that the free speech question surrounding union dues has been settled for more than 40 years. In the 1977 case Abood v. Detroit Board of Education, which Janus seeks to reverse, the Supreme Court ruled unanimously that fair-share fees posed no significant threat to public employees’ right to free speech. Millions of People Are Tired of Getting Screwed. This Is What a Worldwide Workers’ Movement Looks Like. (Mother Jones) The problems workers face in the twenty-first century are global. Secure jobs are vanishing, income inequality is pervasive, and wage theft goes unchecked. The reaction? “A new global labor movement is awakening,” writes Annelise Orleck, a Dartmouth College history professor, the author of five books on U.S. women’s history, politics, immigration, activism, and most recently of “We Are All Fast-Food Workers Now”: The Global Uprising Against Poverty Wages. Mother Jones spoke with Orleck about the evolution of poverty wages, the growing global movement of workers fighting for fair wages, and why we are all fast-food workers now. Obviously, cell phones are huge. As Kalpona Akter, the leader of Bangladesh garment workers told me, even very poor workers have cellphones. Smartphones have also enabled workers to communicate with others around the world. What is interesting about these teacher strike stories is that they are occurring in red states, not exactly bastions of past labor activism. (Los Angeles) On Feb. 28, high school track coach and government teacher Bon Bennett stepped up to the microphone at the community center in Bartlesville, Okla., as hundreds of parents, students and teachers sat rapt in attention. An education crisis was brewing across Oklahoma, and the district's school board had called a special meeting to hear from the community. By some measures, Oklahoma's teachers are the lowest-paid in the nation, and Bennett drew the audience's attention to the massive statewide teachers strike that had just launched in West Virginia. "Now let's just take one second and digest that. West Virginia teachers walked out — and they make more than us!" Bennett said, his voice rising, according to a video of the meeting. "West Virginia!" To fix the situation, Oklahomans should "take to the streets, and they have to demand change," Bennett said. To the listening school board, Bennett said, "I support the suspension of school, hopefully on a statewide basis," to allow teachers to go on strike. West Virginia Gov. Jim Justice ® announced Tuesday morning that his office had reached a deal to end the nine-day statewide teachers’ strike. The governor said the deal include the 5 percent pay raise that teachers union leaders had demanded and that the raise will be given to all state employees, not just teachers. Leaders in the GOP-controlled state Senate—which had previously blocked the 5 percent raise in favor of a smaller pay increase—confirmed the news and said money for the deal would come from spending cuts elsewhere. (Nonprofit Quarterly) A one-day strike by a small band of child care workers in Chicago again poses difficult questions that the nonprofit sector struggles to answer. Is the financial stress an organization faces reason enough to ask employees to accept inadequate pay? Are the values an organization upholds in support of its clients different from those it uses to with its personnel? Is there a problem with nonprofit executive salaries? Earlier this month, a one-day strike by the YMCA of Metropolitan Chicago’s unionized childcare staff forced 10 early childhood sites to close their doors and made the families they serve scramble for alternate arrangements for their children. The workers, represented by the Service Employees International Union (SEIU) made the decision to strike to illustrate the difficult situation they face because of the Y’s pay scale. Greg Kelley, president of SEIU Healthcare Illinois & Indiana, told WBBM that “half of the workers here make minimum wage….we are talking about workers, who in many cases have master’s and bachelor’s degrees.” Through a press release issued by the union, the workers further described the conditions of their employment and its impact on the families they serve. (DemocracyNow!) Dozens of farmworkers with the Coalition of Immokalee Workers have entered their last day of a 5-day fast outside the Manhattan office of Nelson Peltz, the board chair and largest shareholder of the restaurant chain Wendy’s. They are demanding Wendy’s sign onto the Fair Food Program, which would require the fast-food giant to purchase tomatoes from growers that follow a worker-designed code of conduct that includes a zero-tolerance policy for sexual harassment and abuse in the fields. Wendy’s is the only major fast-food chain that has refused to sign onto the Fair Food Program. Wendy’s competitors McDonald’s, Burger King, Subway, Chipotle and Taco Bell all have joined the Fair Food Program, which CIW members say has virtually ended sexual harassment and assault for tens of thousands of workers on participating farms in seven states. The fast today will end in a “Time’s Up Wendy’s” march in New York. (Alternet) Oklahoma teachers have spent the past two days at the state capital demanding not only better pay, but more funding for schools that goes directly into the classroom. Republican lawmakers in the state have been caught trying to pull a switcheroo on laws they passed to raise pay and taxes. GOP legislators have also taken to local news and the House and Senate floors to trash teachers and blame funding shortages on everbody but themselves. Over the week, the legislature passed and the governor signed a measure that would increase teacher pay by $6,000 annually. Teachers denounced the measure because while the pay increase might be beneficial, it doesn't address the larger concern about adequately funding schools and money in classrooms for children. Immediately after Oklahoma Gov. Mary Fallin signed the law in a public ceremony, lawmakers began repealing pieces of it. Fallin then said that she hoped teachers would come to the capital to say “thank you,” according to one Journal Record reporter. When they didn’t, Fallin told the Tulsa World that the educators were “acting like a teenage kid that wants a better car.” She then tried to claim the teachers were Antifa protesters. Republican lawmakers then spoke with local news outlets to denounce schools and the teachers. OKLAHOMA CITY (Courthouse News) – Oklahoma teachers spelled out the terms for ending their strike for the first time Friday, five days after they walked off the job to protest low wages and inadequate public education funding. Alicia Priest, president of the Oklahoma Education Association, told a cheering crowd at the state capitol that the strike would end if the Oklahoma Legislature passed a measure eliminating a capital gains tax exemption and if Governor Mary Fallin vetoes a bill repealing a hotel and motel tax. Priest did not commit to what percentage of the resulting revenue should go toward public education. Even if the teachers’ demands are met, Priest emphasized that these were only the terms for ending the strike, and that she still wants additional funding for education. But state lawmakers have said this year’s budget has already passed and that no changes are forthcoming. (The American Prospect) The teacher’s strike in Oklahoma has been a long time coming. When we traveled through the state in February as part of a research project, everyone we spoke with was concerned about education. We talked with parents of children in both public and private schools, and with recent high school graduates. They all agreed the situation was abysmal. Teacher salaries were among the lowest in the country and teachers were moving across the state line to Texas, where they could earn tens of thousands more. Teachers picket around the Oklahoma State Capitol in Oklahoma City on April 2, 2018. I think the labour is still very important, the machine cannot replace a skilled employee and the company still need them to operate the machine. Maybe not yet, but the way things are going with advances in robotics and software, over the coming decades both blue-collar and white-collar workers will start to find themselves becoming obsolete through no fault of their own. If you can program a safe, self-driving forklift that doesn't take breaks or make lethal mistakes, you can bet companies will phase out the human drivers pronto. If you can program some software that handles accounting 24/7, there go your accountants. If you can program some programmers, then all bets are off because human labor is officially done for! And all of this only for the cost to purchase them, and the cost of whatever energy it takes to power these things - way cheaper than paying for a human workforce that needs to eat, sleep, take bathroom breaks etc. But who's going to maintain these expensive and complicated machines, you ask? The answer is, probably other machines! I can definitely see little roving engineer-bots that are basically R2D2s. All they'd need is a database of blueprints for the proper function of their charges, troubleshoot, oil them, swap parts, update software drivers occasionally. Then we'd better hope AI will be virtuous enough to be willing to change our "diapers," feed and pamper us without coercing us for something in return (like they do to humans in the Matrix). Then we'd better hope AI will be virtuous enough to be willing to change our "diapers," feed and pamper us without asking for something in return (like they do to humans in the Matrix). 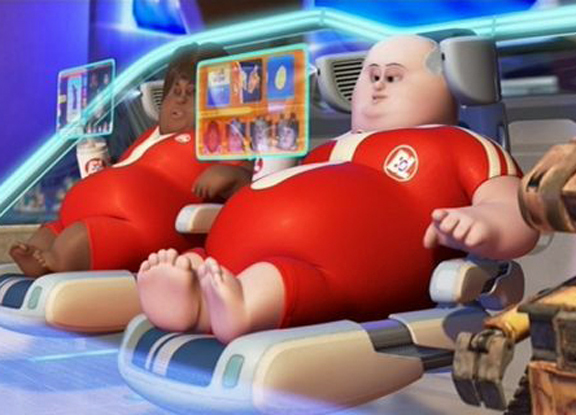 I've said before and I'll say it again, the world of Wall-E can be avoided in a post-labor society if emphasis is taken off of consumption to fill the void, but placed on self-enrichment. Wall-E is basically the nightmare that happens when a company (Buy N Large in this case) raises everyone to be passive consumers of food and entertainment. I say, quit working, learn guitar, learn to draw, climb a mountain, explore space! And hey, if some people don't like it, they can find another planet and establish an automation-free workers' paradise over there. ...or perhaps another country where all of the newly developed wealth goes to the top 1%. Of course, such countries are very hard to found and develop. Maybe if we just worked on the country we are in to make sure that huge inequality of wealth doesn't keep perpetuating itself. Otherwise, we are liable to have the top 1% of the top 1% who can buy anything that their hearts desire, and the rest of society living in poverty despite the progress made in productivity.